For discrete data, numbers between two data values will make no sense. For example, suppose that the cost of producing a car is 20000 dollars. This situation will give discrete data only since you cannot produce half of a car, three-fourths of a car or two and a half car. The table below shows the costs of producing 1, 2, 3, or 4 cars. If the company could produce 1.5 car, it will cost 30000. However, there is no such thing as 1.5 car. 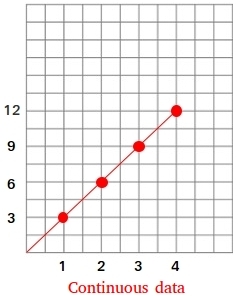 Here is what the graph of a discrete data will look like. Notice that we cannot connect the points since the numbers between 1 and 2, 2 and 3, 3 and 4 do not exist. On the other hand, a continuous data can have numbers between any two data values that make sense. Suppose the cost of grapes is 3 dollars per pound. The number of pounds you buy could be 1, 1.5, 2, 3, 3.5, 4. Here is what the graph of a continuous data will look like. 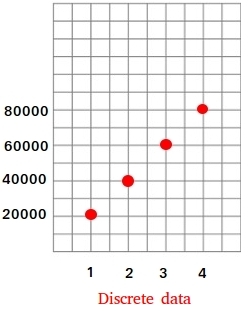 In the graph above, we show the points (1 3), (2, 6), (3, 9), and (4, 12). (3, 9) of course means that 3 pounds cost 9 dollars. Notice how any number of pounds could be chosen between 0 and 1, 1 and 2, 2 and 3, 3 and 4.